So if I could choose one dessert to eat for the rest of my life it would most likely be brownies. They are one of the only ways that I enjoy chocolate on it’s own. Now I like me a good chocolate cake once in awhile but I usually am not a fan of chocolate cake with chocolate frosting unless its my Triple Chocolate Cake. Sometimes there is such a thing as too much chocolate in my personal opinion. So let me tell you about these Peanut Butter Brownies. Well for one they are addicting and AMAZING. There really are no more words that you really need to describe these pieces of heaven. Another thing is that they are semi-homemade. Now I know in previous posts I’ve had conversations about how I am not against anything semi-homemade ever. 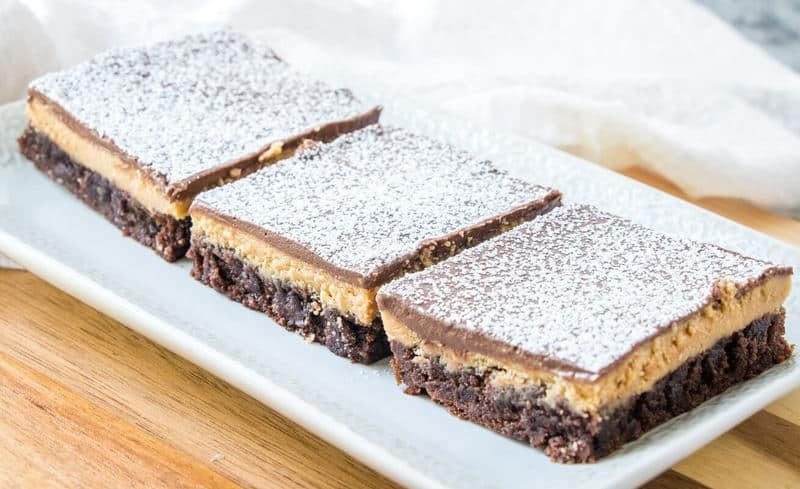 I don’t always have the time to bake from scratch so using a boxed mix for some desserts is a necessary and ultimately delicious option such as these chocolate peanut butter brownies. If you do want to make this more homemade then this brownie recipe will do wonders, it’s one of my favorite recipes ever! 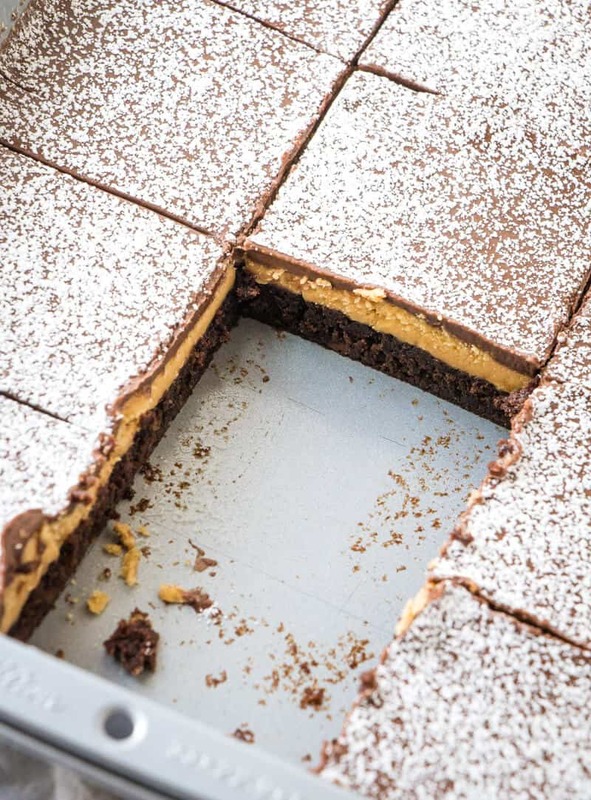 The base of this brownie goes great with pretty much any topping or mix in that you want. They are thick and fudgy just how I love my brownies. Ok anyways, let me tell you a little bit more about these bad boys. They are a brownie base, a peanut butter topping, creamy chocolate frosting and then a light coat of powdered sugar. I actually got this recipe from my friend who lives down the road. He likes to bake in his spare time and he was telling us about these brownies that he had made so we made him go get them and feed them to us, and I’m so glad that he did because they are delicious. How simple is that list? Literally, we usually keep all those ingredients in our pantry and any given time. Like I said I’m a brownie person so I always have to have a box on hand when I’m feeling a little lazy and want to whip something up super quick. These brownies do require a little chill time, but they are 100% worth that wait. I don’t think that I’ve had such a good dessert like this one in a long long time. So that is tell you something, I’m like the dessert queen, I always go to bed with a sweet snack, every day. 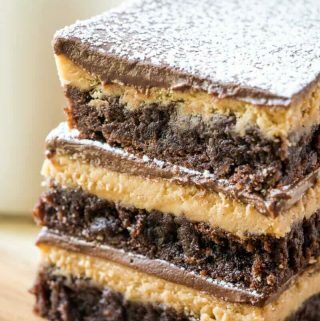 HOW DO YOU MAKE THESE CHOCOLATE PEANUT BUTTER BROWNIES? Mix together ingredients called for on back of brownie box then fold in 1 cup mini chocolate chips and bake according to package direction. Meanwhile in bowl beat together peanut butter and butter until smooth, slowly add in your powdered sugar until combined. Add in heavy cream a little bit at a time until you reach spreading consistency. Once brownies are down remove from oven and immediately spread with peanut butter mixture and set aside. Remove top and tin lid from chocolate frosting and place in microwave and heat for about 1 minute and then stir, return to microwave and heat in 30 second increments until smooth. 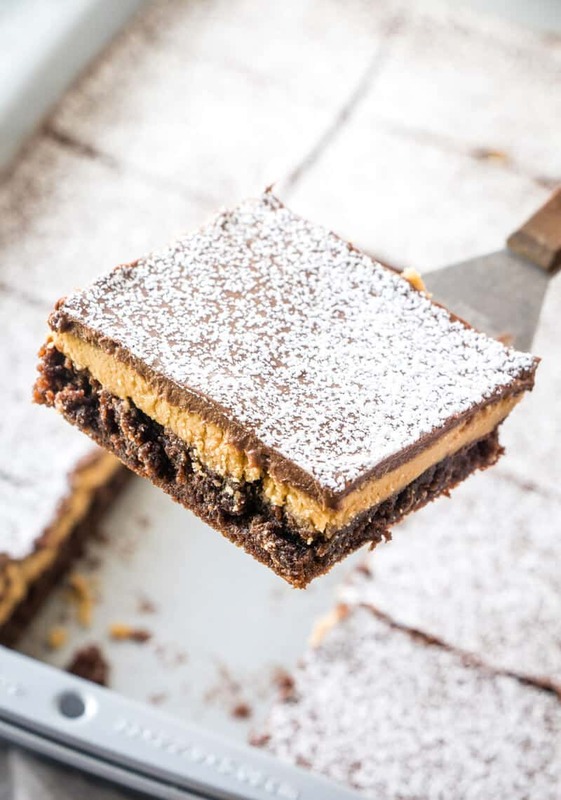 Pour over peanut butter layer and spread evenly over the top with an offset spatula. Refrigerate for about one hour until set. Sprinkle with powdered sugar if desired, cut and serve. I’m completely addicted to these puppies. I make them over and over and over again and just cant quit, and I don’t know if that is a good thing or a bad thing, all I know is that in the moment that I’m eating them I’m in heaven. 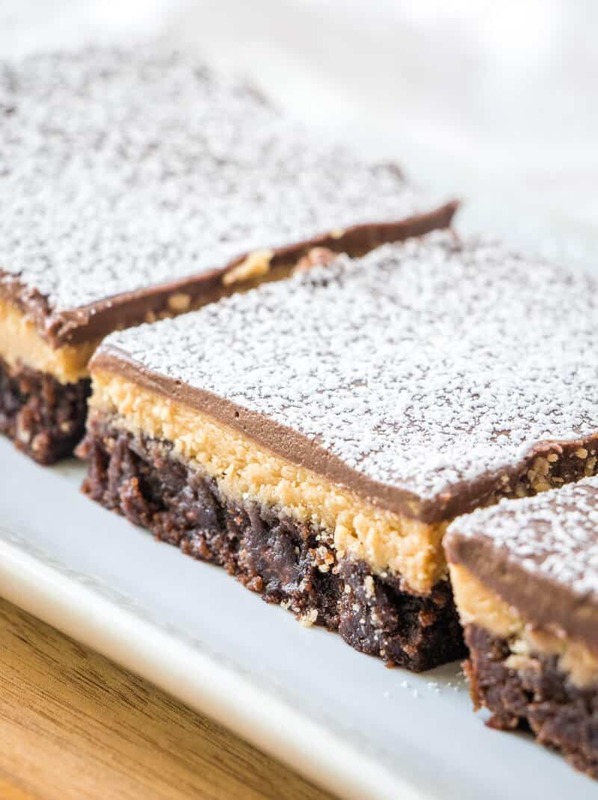 So if you want that perfect brownie recipe than you have to whip up a batch of these Ultimate Peanut Butter Brownies, you will not be sorry. OOOOOMMMMGGGGG! These brownies are everything!! 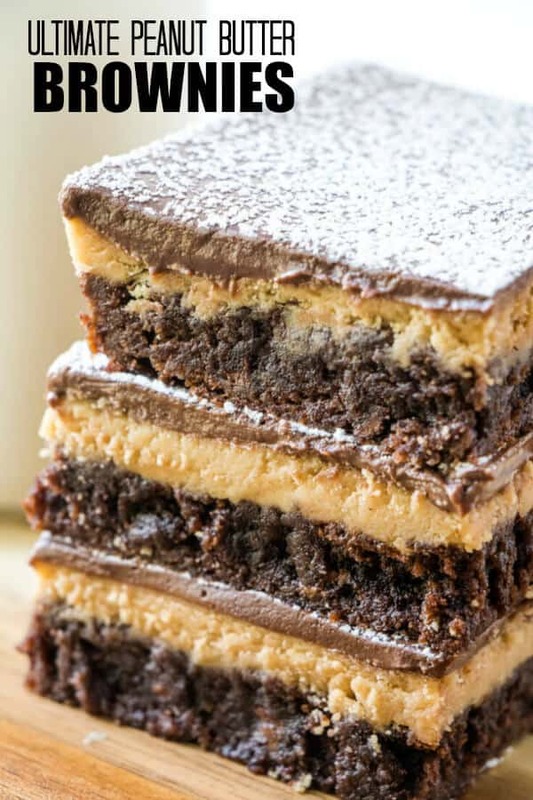 That layer of peanut butter…yum! Chocolate and peanut butter is my all-time FAVORITE combo! These looks so yummy! Hello lover! These brownies are absolutely to die for delicious – so simple and easy, but out of this world flavor! Pure HEAVEN right here!! So good! Thank you! These definitely look ultimate!! I cant wait to try these out! 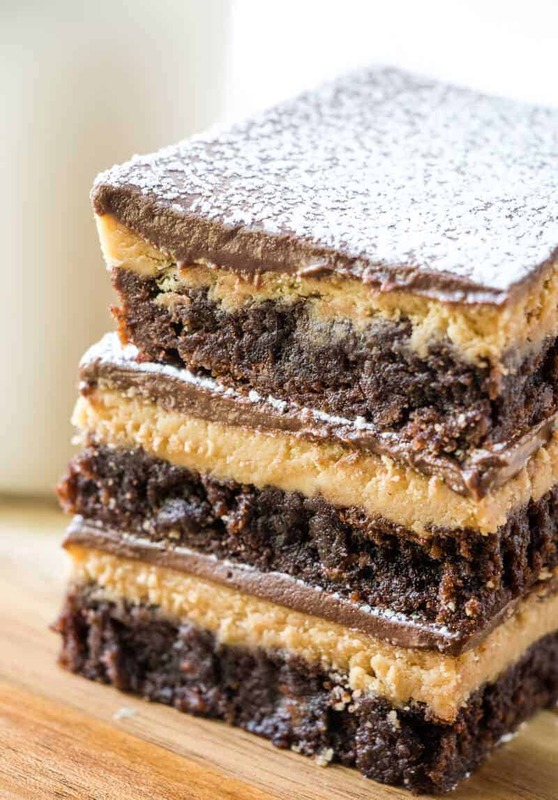 Two quick questions… what size brownie mix are you using and are we baking this in a 13X9 pan? I’m sorry I will update that in the recipe! It’s a standard 18.3 (depending on the brand) mix and yes a 9”x13” pan.